The estranged wife of a California limo driver involved in a fiery accident that killed five women on the San Mateo Bridge broke her silence on Sunday. And she made some startling claims about her husband, the driver, including an accusation that he was talking to her on his cell phone, and was distracted just minutes before the limo burst into flames on May 4. Rachel Hernandez-Brown said she was arguing with her husband on the phone just minutes before the Bay Area bridge tragedy. And she’s raising concerns that he was too distracted to react quickly when the limo burst into flames. "I said, I started yelling, ‘Oh my God, turn it down, turn the friggin music down!’"
Rachel Hernandez-Brown told NBC Bay Area that her husband, Orville Brown, even turned up the music as she argued with him on the phone so the women in the back of the limo couldn’t hear them fighting. "He cussed, he was cussing me out and saying ‘I can’t really talk because I have clients in the car and I can’t be unprofessional.’ Then that’s when I said, ‘maybe you need to pay attention to the road and leave me alone and do your job.'" What remains unclear is whether an argument slowed his response when one of the passengers started pounding on the closed partition. A new bride and four of her friends died in the May 4 fire on the San Mateo Bridge. The cause of which is still under investigation. Survivor Nelia Arellano told NBC Bay Area in a May 6 interview that Brown was on the phone when the limo was filling with smoke. "There is smoke and then the fire came out. Stop the car, stop the car! " In an interview with NBC Bay Area's Cheryl Hurd just days after the fire, Brown expressed grief for the victims, and later, his attorney denied that Brown was on the phone at the time of the fire. Brown said a language barrier and a misunderstanding prevented him from pulling over sooner. Brown says: "I’m thinking that she’d like to smoke because they weren’t panicking." Hernandez-Brown described a volatile relationship with Brown, saying they split up a month before the fire, and earlier, on the day of the fire, police were called to a Walgreens parking lot where the two had argued--and Brown allegedly kicked his wife’s car. Hernandez-Brown says investigators still have not contacted her. NBC Bay Area spoke with the San Mateo County District Attorney's office on Sunday, and they said that they would be following up on Hernandez-Brown's claim. 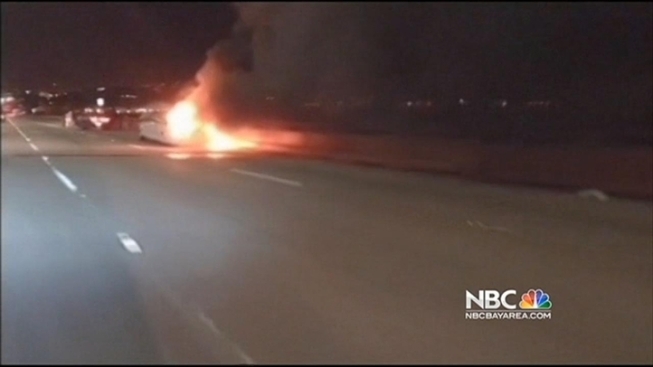 A viewer sent NBC Bay Area the below video from the scene. He said he had no idea people were trapped.